Cinnamon Rolls | Pretty. Simple. Sweet. Freshly baked cinnamon rolls made from scratch. The perfect balance between delicate, fluffy dough and a sweet cinnamon filling, these tasty rolls will fill your house with a delightful smell as they bake. 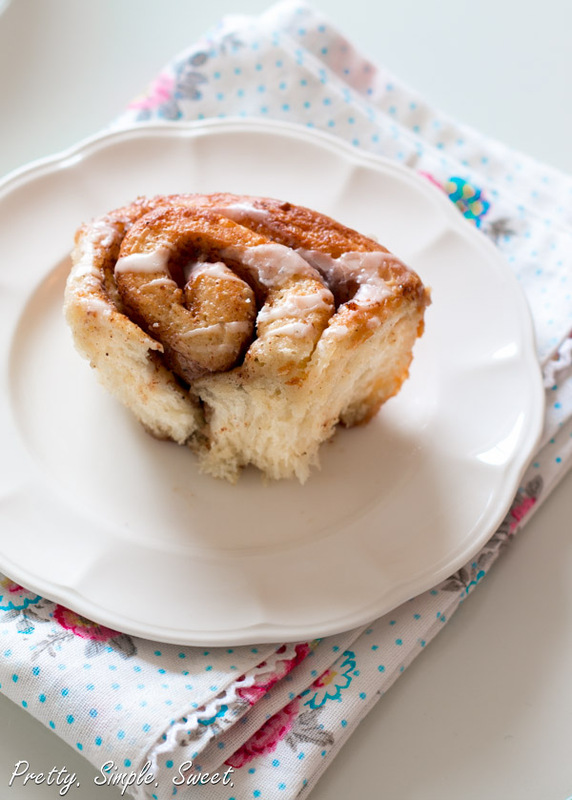 Read this post for a detailed guide on how to make perfect cinnamon rolls. Yesterday, it was raining like crazy! While I was getting all cozy under the covers and switching the TV channels every 2 minutes, I got bored. And hungry. As always. So I baked what I consider to be the perfect comfort food on a cold day. Cinnamon rolls! Let me start by saying that although cinnamon rolls take some time to make – they really aren’t as hard as one might think. Most of the time is spent waiting for the dough to rise. I promise you – It is so worthwhile that by the time the first batch I made was gone, I wanted to start making a second one. The more you make them, the simpler it becomes. Conclusion: make cinnamon rolls as much as possible. These cinnamon rolls are unbelievably good. So soft and fluffy! And then there’s all that cinnamon and sugar… I used light brown sugar to give it more of a caramel flavor. 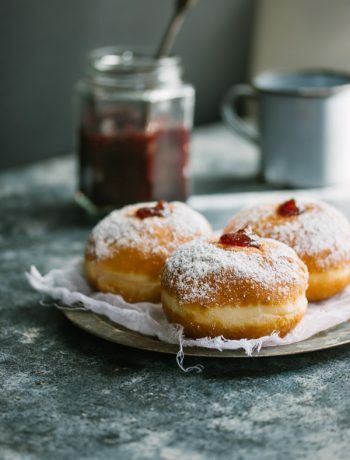 It might look like a lot of sugar when you first start to spread it on the rolled dough, but you will see once they are done baking that it’s just right. They are sweet rolls after all! Let’s see how we make these babies, shall we? Make the dough. If you have a mixer with a dough hook it will do most of the work for you. If not, don’t worry, it can be done manually. Let the sweet rolls rest for an hour in a warm environment until they double in size. You are probably thinking, what the heck is a warm environment, right? I have a trick for you that will work like a charm. Roll it. Using a rolling pin, roll the dough into a rectangle. Spread it with melted butter and cinnamon-sugar mixture. Roll it into a log shape and cut into individual rolls. Place them in a pan. Nap time (for the rolls). Let the cinnamon rolls rest in pan for 30-45 minutes until they double in size. The second time, it’s even easier! Bake for 25-30 minutes. I have to warn you about this one. Your house will smell like the Cinnabon bakery. You won’t be able to concentrate on anything else until they’re out of the oven. Now back to the beginning. Start by sprinkling the dry yeast over lukewarm liquid (i.e. milk/water). What exactly is lukewarm? 110F/45C. If you don’t have a thermometer, do the baby milk trick. You know, when you pour a drop of milk on your hand to check if it’s not too hot (I don’t have babies but I have nieces). If the liquid is too hot (over 130F) the yeast will die. And we don’t want anyone to die. My recipe is made with a half cup of water and a half cup of milk so what I did was mixing half cup of hot water with half cup of cold milk. That way, it reached the right temperature (this will work for this recipe only. In other cases you’ll just have to warm up the liquid). After you have verified that the liquid is the right temperature, sprinkle the yeast on top of the lukewarm milk-water mixture. Let it sit for 10 minutes. The yeast will start to look foamy. In the meantime, in a separate bowl (or a mixer bowl) mix all the other ingredients, except for the flour. Add the yeast mixture and mix just until combined. This can be done by hand or with the mixer on low speed. Add 3 cups of the flour and mix, by hand – with a wooden spoon or using the mixer on low speed using the dough hook. Mix until the dough starts to come together. You’ll probably need to add more flour at this point – 2 tablespoons at a time, until the dough is smooth and starts to pull away from the sides of the bowl. For my dough I used exactly 450 grams flour – about 3¼ – 3½ cups. Do not use more than 3½ cups. After you add all the flour and the dough has come together, keep kneading the dough on low speed in the mixer for 5 minutes, or by hand on a floured surface for 7-8 minutes. The dough should be smooth and elastic, just slightly sticky and easy to handle. Put the dough in a greased bowl and cover it with a plastic wrap. Let it rest until it doubles in size. Dough rises best in warm environments. Here I have a trick for you that works for me every single time. Put an oven rack in the middle of your oven. Fill a pan or a bowl with hot water and place it on the bottom of the oven. Then let the dough rest on the oven rack in the middle. Close the oven door. This is optional. You can let the dough rest on the counter as well. Moving on to part 3 (& 4). Take the dough out of the oven and gently punch it to remove the air. Next, roll it on a floured surface into a 14*10 inch rectangle (about the size of a silpat baking mat). If the rectangle is a bit bigger or smaller, that’s fine. It should be very easy to roll out the dough. Spread the melted butter on the dough. The butter should be room temperature, not hot. 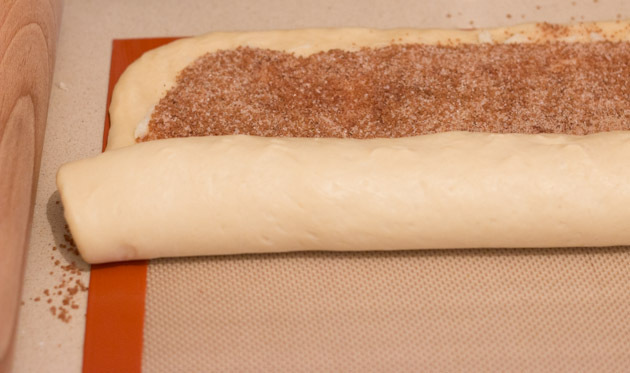 Then sprinkle with the cinnamon-sugar mixture, leaving a small border around the edges of the dough. Press the sugar mixture gently into the dough so it sticks to the butter. Cover rolls with plastic wrap and let them rise for 30-45 minutes, until doubled in size. (If you use my trick and let the rolls rise in the oven, after 30 minutes of resting, take the rolls out in order to preheat your oven for the next step, which is baking the rolls.) When the rolls have doubled in size, it’s time to bake them. This brings us to the last part. 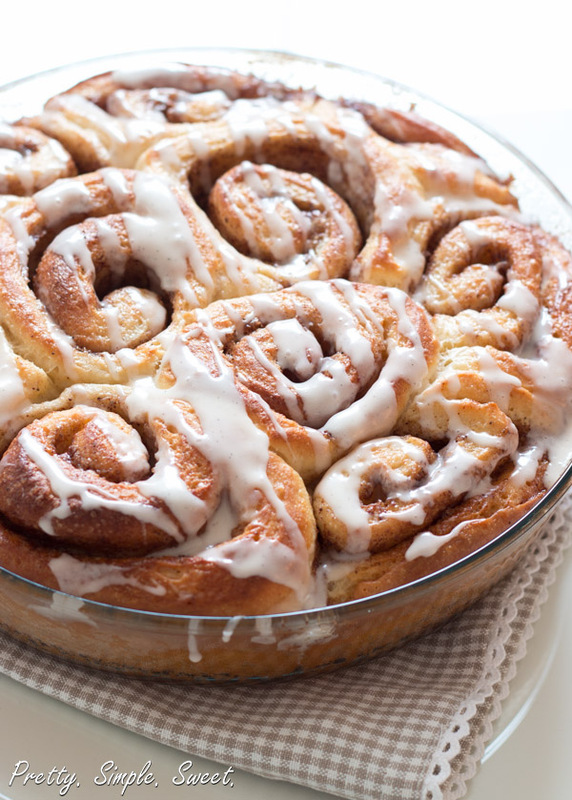 Brush your cinnamon rolls with heavy/light cream or milk (not mandatory). Bake them for 25-30 minutes. When they are ready, a toothpick inserted into the rolls should come out clean. You can top the rolls loosely with aluminum foil after 15 minutes, if they start to brown too much. The glaze is optional but is delicious, sticky (in a good way) and pretty. So let me repeat it for the third time just to make sure you’ve got it… the best part is the cinnamon-y smell which is about to fill your entire house… you won’t be able to control yourself! Freshly baked cinnamon rolls made from scratch. 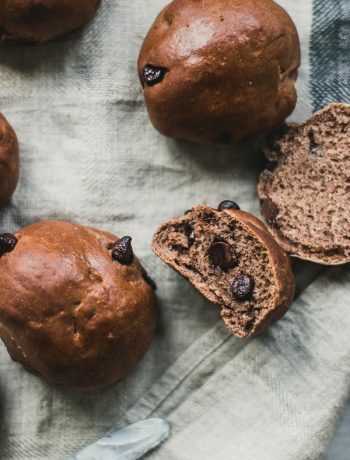 The perfect balance between a delicate, fluffy dough and a sweet cinnamon filling, these tasty rolls will fill your house with a delightful smell as they bake. In a small saucepan, heat water and milk until lukewarm (110F-115F). Sprinkle the yeast over the lukewarm milk mixture and let it sit for 10 minutes. In a bowl of a standing mixer fitted with a dough hook (If you don’t have a mixer, mix by hand), add the butter, egg, sugar and salt and mix. Add the milk mixture and mix until combined. Add 3 cups of flour and mix on low speed (or mix by hand with a wooden spoon) until combined. Add the remaining flour, 2 tablespoons at a time, stirring well after each addition until the dough comes together and pulls away from the sides of the bowl. The dough should be soft, smooth, elastic and just slightly sticky. Once it has reached this consistency, keep kneading on low speed in the mixer for 5 minutes, or by hand on a floured surface for 7-8 minutes. 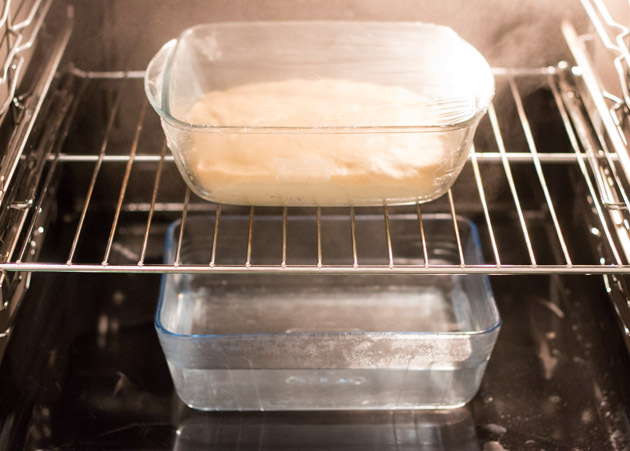 Cover the dough with plastic wrap and let rest in a warm place for about an hour until doubles in size. Meanwhile, make the filling. In a small bowl, mix together sugar and cinnamon. When the dough has doubled in size, gently punch it to remove air. Then, roll it into a 14x10 inch rectangle. Leaving small border around the edges, spread the dough with butter, then with sugar mixture and press gently. Roll up dough to form a log, starting with the longer edge, and pinch to seam seal. Cut into 12 equal size rolls and place cut side up in a greased 9-inch round pan or 9*13-inch pan. Cover and let rest to rise for about 30-45 minutes or until it doubles in size. Brush the rolls with heavy/light cream or milk (optional). Bake cinnamon rolls in the preheated oven for 25-30 minutes, until the tops have browned and a skewer inserted into the rolls comes out clean. If the rolls brown too fast, cover them loosely with aluminum foil. To make the glaze, mix all ingredients together, adding little cream at a time until the desired consistency. Then, drizzle over the rolls. Serve warm or reheat before serving. אני חולת קינמון ומכינה המון בצקי שמרים (אני מתמחה בבצקי חלות) ורק לראות את התמונות אני חצי בעילפון! אני רק יכולה לדמיין זוללת חצי תבנית עכשיו. ושוב – זה נראה משגע!! לא נורא וויני, ככה יהיה למה לצפות לאחר החג 🙂 ואם את מומחית לחלות, תפני אותי לאחד המתכונים הטובים שלך בבקשה ואכין בהקדם! I like your conclusion! More cinnamon = better. These look great! Hahaha… I know 🙂 I can’t get enough of these rolls! 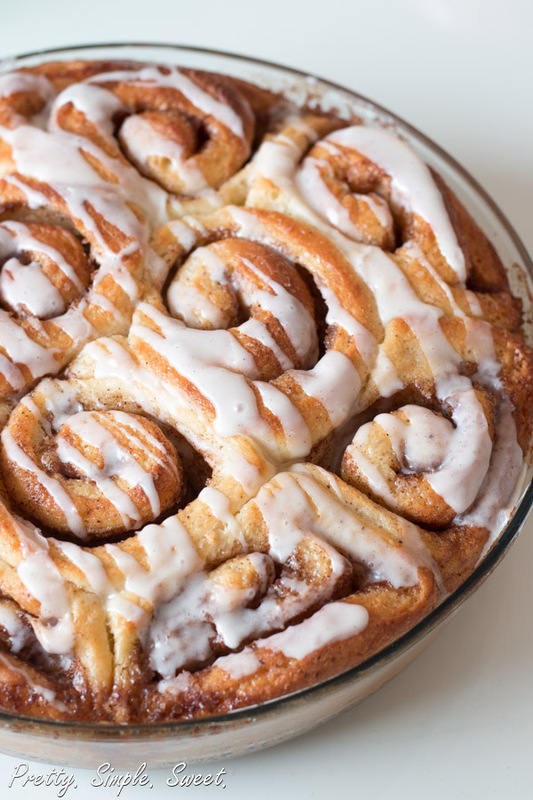 There’s nothing better than homemade cinnamon rolls. Yours look amazing! Thank you Ashley 🙂 There really isn’t nothing better than homemade cinnamon rolls! Who doesn’t love cinnamon rolls! I could have finished the whole bunch! These look fantastic. I just love love cinnamon rolls. One of my all time favorite treats. These look so good. I can just imagine how wonderful they smell baking. Pinning!! Thank you Cindy 🙂 They are one of my favorite treats too! These look phenomenal! Question for you…If I were to start the process the night before, would I place the cut rolls in the fridge before or after the second rise? Or maybe it’s best to bake them and then reheat and drizzle in the morning. Have you ever tried that? Hi Cindy! I always make rolls ahead of time, and they are best the day they are made 🙂 After you shape the dough into rolls, arrange them in the pan, cover with plastic wrap and place them in the fridge (before the rise). The next morning, remove them from the fridge and leave them on the counter to rise for about an hour. Hi Matti! You can read the above comment I wrote to Cindy about making the rolls ahead of time. But, if you want to bake the rolls, then freeze them it’s also possible. Thaw the rolls a few hours before using them, then warm them briefly in the oven before serving. I made these last night and they were SOOOOO freaking good. Way better than anything store bought. And you’re right, the house smells amazing while they bake. Thanks for posting this. 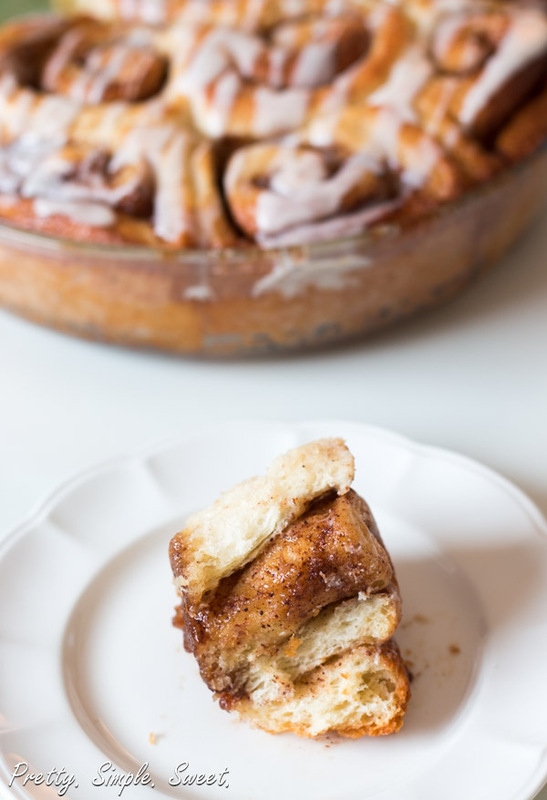 It will be my go-to recipe for cinnamon rolls from now on! It makes me so happy! Thank you for taking the time to share with me how much you loved them! They are my go-to recipe, too! Hi Jodi! 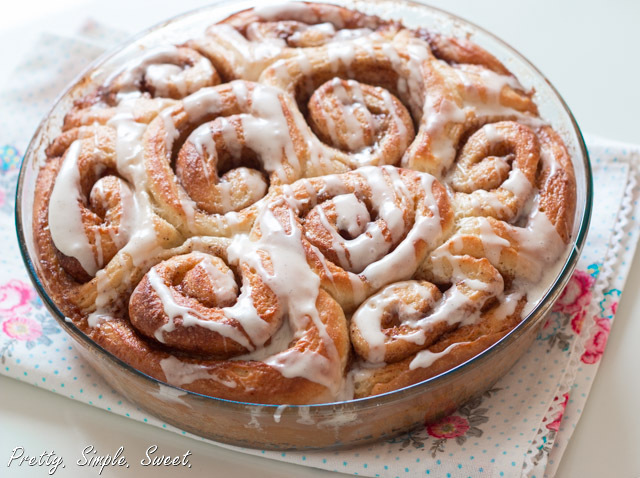 This recipe for cinnamon rolls is super fluffy and soft! Did you try making it? Hi Darsan! I’m so glad to hear that! Thank you 🙂 I have a few recipes for cinnamon rolls but I really like this one, it’s so fluffy, soft and full of flavor! 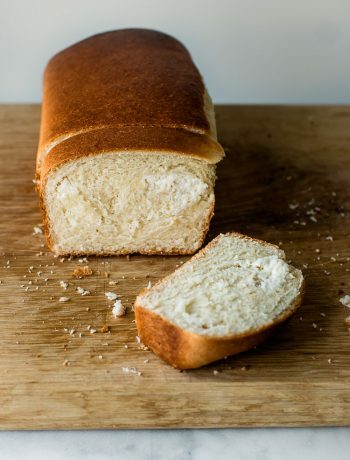 Can you use instant yeast for this recipe ? Hi Rayna, yes you can, use 2 teaspoons of instant yeast instead. Also, skip the part of “proofing” the yeast (the part when you sprinkle the yeast over the milk), and just add it along with the flour. היי שירן! האם אפשר להשתמש בשמרים טריים (קוביה) ואם כן, מה הכמות? אני נמצאת במקום שבו קשה למצוא שמרים יבשים לצערי.. Yes you can! Here’s a good guide on how to convert between them. First of all I really like your blog 🙂 I have found it a week ago and I have already tried your cheescake brownie recipe. Brownies were fantastic, definetely the best I have ever baked and I have tried quite a few recepies. So thank you for that. Fr cinnamon rolls: I have a question. In my country (Slovenia, you probably never heard of because it’s a really small country in Europe … but never mind) yeast can be bought in these blocks… I don’t know how to call it… on the internet it was called “a block of compressed fresh yest”. How much should I use? Thank you for answer. 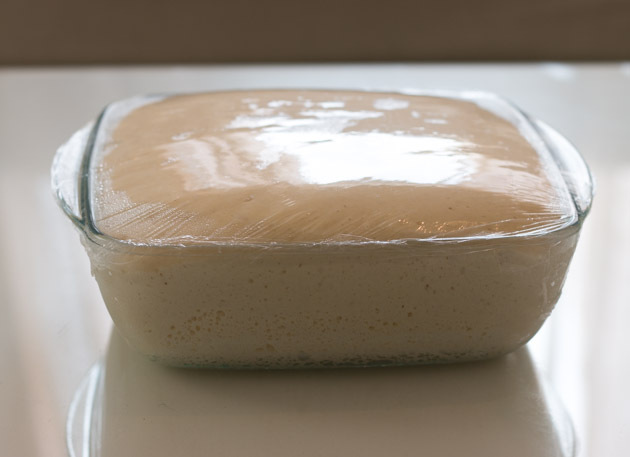 If using fresh yeast, you’ll need to use about 20 grams – the rule of thumb is multiplying the weight of dry yeast by 3. You should read the label to understand how to use it/add it to the flour. Just letting you know that I have just made these and they are delicious! I made them for my older sister’s birthday (she is 19) and she loved it. Maybe I did roll the dough too thin… I don’t know. But anyway, they were great. And for the glaze I used vanilla pod, because I really like those tiny black dots in a frosting or cream or glaze or whatever 😀 The glaze is also great. And thank you for your soon answer about yeast. Wow !I followed your instructions , and they were fabulous!!! I actually wanted to do a taste test with my family. I made your recipe and a different one that said they were the best cinnamon rolls ever. ( I made them the same day, just to have a fair comparison). Your recipe won out! . Even reheating them the next day, yours just tasted better! I did double the icing recipe, just because I love icing. Funny thing I tasted it without icing and they were still very tasty and so soft. Delicious! This is now my only cinnamon roll recipe. : ) Thank you for sharing!